A number of structural and functional mechanisms have been identified in the pathogenesis of hypertensive vascular disease, each of which requires effective therapy to reduce global cardiovascular risk. 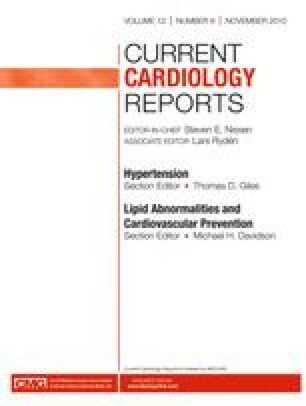 Hypertension, together with other cardiovascular risk factors, promotes endothelial dysfunction as evidenced by decreased nitric oxide (NO) release and reduced vascular responsiveness to normal vasodilatory stimuli. In addition, the mechanical forces inherent in hypertension activate neurohormonal mechanisms, including the renin-angiotensin system, which modulate vessel wall structure and function. Antihypertensive drugs may have class-specific hemodynamic and physiologic effects that attenuate these vascular disease processes. Pharmacologic approaches that enhance endothelial NO bioavailability have been shown to restore vasodilation while reducing clinical events. These agents improve NO bioavailability by increasing endogenous production through enzymatic mechanisms or by promoting the direct release of NO by its redox congeners in a spontaneous fashion. In this article, we review the basic mechanisms of endothelial dysfunction along with the use and comparative therapeutic benefits of various pharmacologic interventions, with particular emphasis on antihypertensive agents. Dr. R. Preston Mason has received preclinical research funding from Astra Zeneca, Daiichi Sankyo, Forest Research Institute, NicOx, Novartis, Pfizer, and Sanofi Aventis. No other potential conflicts of interest relevant to this article were reported.